Members of the American Association of State Highway and Transportation Officials (AASHTO) now have direct access to a suite of web-based tools that make it easy to set targets and submit data under the federal legislation known as MAP-21. Developed by the University of Maryland (UMD) Center for Advanced Transportation Technology Laboratory (CATT Lab), the MAP-21 Analytics Tools have been adopted by 30 states to improve system performance and combat freight congestion. The tools are available through AASHTO’s Transportation Performance Management pooled fund. “We are proud to be able to bring our expertise to bear to equip states and regions with these cutting-edge tools that improve users’ access to critical data and reduce the time and money needed to meet federal reporting requirements,” said Michael Pack, director of CATT Lab. The Moving Ahead for Progress in the 21st Century Act requires state and regional agencies to report on travel times, reliability, delays, and other transportation performance measures. The information and data generated is expected to inform local transportation planning and decision making while also allowing the Federal Highway Administration (FWHA) to better assess the impacts of federal funding investments. CATT Lab’s MAP-21 Analytics Tools make it easy to compute, visualize, and download all required metrics. Users can also output performance measures as charts, maps, and data files ready for reporting up to FHWA. AASHTO members interested in pushing beyond MAP-21 requirements can subscribe to CATT Lab’s broader suite of analytical and visualization tools. These resources dovetail with the Map-21 Analytics Tools to help agencies also calculate the cost of daily congestion on commercial vehicle operators and the public, measure the benefits of construction projects, conduct after-action reviews and root-cause analysis, and understand where to invest transportation dollars. 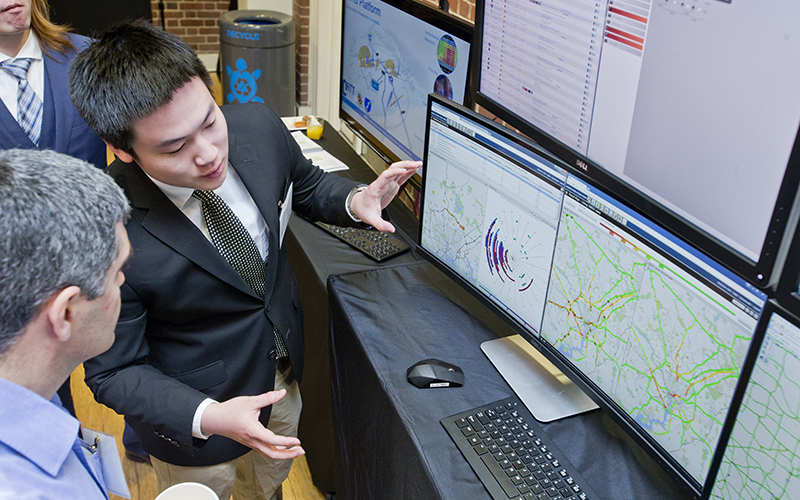 CATT Lab, part of UMD’s Department of Civil and Environmental Engineering, houses the largest transportation big data archive in the world and focuses on solutions for operations and planning. With a team of more than 100 engineers, software developers, and researchers, the lab develops analysis, visualization, training, and educational tools that transform transportation planning, resource use, coordination, and real-time operations by local, state, and federal agencies as well as private companies. UMD, along with partners INRIX and the Texas A&M Transportation Institute, was selected by AASHTO to be their sole provider of highway performance analytics earlier this year. The initiative also provides functionality and technical support that make it easier for agencies to make use of the tools. For example, an “easy button” immediately generates all the necessary files and required deliverables, and training webinars, how-to videos, and one-on-one technical support ensure users get the most from CATT Lab’s cutting-edge tools. There are no restrictions on the number of users from each state. Metropolitan planning organizations in states that choose not to participate can also participate directly. Transportation officials and planners are encouraged to contact Michael Pack at PackML@umd.edu or AASHTO’s Matt Hardy at mhardy@aashto.org for additional information.